For those of us associated with the Reorganization, the revelation received by Jason Briggs in November, 1851, is significant. It was not only the beginning point of the Reorganization, but according to an article at restorationbookstore.org entitled “The Importance of the Revelation Given to Jason Briggs,” it was the Lord’s declaration that Joseph was innocent of polygamy. After the death of Joseph Smith, Jr., on June 27, 1844, the Church was thrown into chaos, and many factions formed due to two points of doctrine. Even though Joseph had designated his son, Joseph III, four times—in the Liberty Jail, the Red Brick Store, the Grove in Nauvoo, and the Mansion House—to succeed him according to [RLDS] Doctrine and Covenants, Section 43:1–2 and the law of father-to-son lineal priesthood descent ([RLDS] DC 83:2; 84:3; 104:18), many Church leaders believed it was their right to lead the Church after his death. The men who led the largest groups were Brigham Young, Sidney Rigdon, William Smith, James J. Strang, and Lyman Wight. William Smith (the Martyr's brother) and Lyman Wight, who were both apostles, were the only ones who supported Young Joseph as the next prophet. However, in the years just prior to the Reorganization, William Smith recanted that position and claimed that he was the successor of Joseph Smith, Jr. (see RLDS History of the Church 3:738). The second false doctrine common to many of the factions was the teaching and practice of spiritual wifery (also known as plural marriage, celestial marriage, or polygamy). Within those factions this false teaching proved to be a source of discontent to those who sought to remain true to the beliefs of the Church. In the first part of 1851, Jason Briggs and the Beloit, Wisconsin, Branch left Strang and associated with William Smith's group. William was teaching that Young Joseph was the rightful heir to the Presidency of the High Priesthood. However, in the fall of that year Briggs learned that William Smith was beginning to advocate two new doctrines in his organization: the practice of polygamy and that he was the true successor to Joseph the Martyr (see ibid., 738). In addition, none of the other factions seemed to be teaching the original doctrines of the Church established by Joseph. Briggs had been ordained an elder in the Church prior to Joseph's death and wanted to continue to minister for the Lord, but he could not find a group that he believed represented the Church in Joseph's day. Under these circumstances Jason Briggs went to the Lord in prayer asking for divine guidance as to what he was to do. "But as Esau despised his birthright, so has William Smith despised my law, and forfeited that which pertained to him as an apostle and high priest in my church. And his spokesman, Joseph Wood, shall fall with him, for they are rejected of me. They shall be degraded in their lives, and shall die without regard; for they have wholly forsaken my law, and given themselves to all manner of uncleanness, and prostituted my law and the keys of power entrusted to them, to the lusts of the flesh, and have run greedily in the way of adultery. The article then goes on to explain how the revelation proves Joseph was innocent of polygamy. One of the most important parts of this revelation is the Lord's condemnation of polygamy and His indication of Joseph's innocence. In the last paragraph the Lord states, "Behold, that which ye received as my celestial law is not of me, but is the doctrine of Baalam. And I command you to denounce it and proclaim against it...." (Of course, the reference to "celestial law" means celestial marriage which is spiritual wifery or polygamy.) [In recent years] polygamy has become newsworthy, and Joseph Smith, Jr., is unquestioningly credited by the media for its inception within the Latter Day Saint movement. For those of us having the common heritage of the Reorganization, the revelation received by Jason Briggs should remove all doubt of Joseph's innocence in the teaching or practice of polygamy. In the third paragraph of the revelation, the Lord said that William Smith and his spokesman, Joseph Wood, had "given themselves to all manner of uncleanness, and prostituted my law and the keys of power intrusted to them, to the lusts of the flesh, and have run greedily in the way of adultery." In essence, because of William Smith's polygamy teachings, the Lord called him an adulterer. However, four times in the same revelation, the Lord called Joseph His servant. Since God is unchangeable and no respecter of persons, if Joseph had taught or practiced polygamy, the Lord would have also indicated he was an adulterer. Since the Lord unmistakably called Joseph His servant, this revelation is confirmation that Joseph did not teach nor practice polygamy. Thus, no one who claims the divinity of the Reorganization should ever doubt the innocence of Joseph regarding polygamy—for the Lord, Himself, proclaimed him innocent. Do we know for certain William Smith advocated polygamy or could Briggs have been mistaken based on heresay by others within the organization? 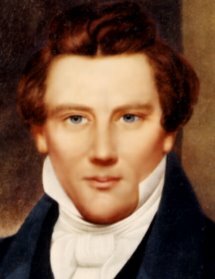 It's my understanding that William united with the Reorganization later in life, accepted as a high priest & wrote 1-2 pamphlets condemning polygamy, defending Joseph Smith, Jr. & denying he taught polygamy himself. Can you shed any light on this? Thank you so much for your interest in this article. I did a little research and came up with some things that might help answer your question. Briggs alleged first hand knowledge of William Smith’s involvement with “spiritual wifery” or polygamy. As editor of The Messenger Jason Briggs (an RLDS apostle at the time) wrote an article in November, 1875, indicating that at a conference he attended at Palestine, Illinois on October 6, 1851, he heard William Smith and other leaders of their church confess “to the belief and practice of polygamy in the name of the Lord. Among those who attended that conference were James Blackeslee, Alva Smith, Edwin Cadwell, C. F. Stiles and E. R. Briggs, of Illinois; and Ira J. Patten, David Powell. Henry Lowe, John Harrington, John O'Neil and J. W. Briggs of Wisconsin....” Also, Briggs’ testimony under oath in the Temple Lot Case (1893) reiterated his position although not nearly with the degree of detail he described in his article. William Smith joined the reorganization in 1878 as a High Priest but did not retain previously held positions of Apostle or Presiding Patriarch. The two pamphlets that I’m aware that he wrote were A Proclamation, and Faithful Warning to all the Saints scattered around... (Galena, Illinois: Self-Published) in June, 1845, and William Smith on Mormonism: A True Account of the Origin of the Book of Mormon (Lamoni, Iowa: RLDS Church) in 1883. I couldn’t find the first one on-line and so can’t attest to its stand on polygamy. However, considering when it was written and that William had an intense hatred of Brigham Young, I would guess that if it dealt with polygamy it was strongly anti-polygamy. I did read the second pamphlet which stated, “We believe that Marriage is ordained of God; and that the law of God provides for but one companion in wedlock, for either man or woman, except in cases where the contract of marriage is broken by death or transgression. We believe that the doctrines of a plurality and a community of wives are heresies, and are opposed to the law of God.” In addition, his testimony under oath in the Temple Lot Case was that he never taught or practiced polygamy. So who do you believe? I tend to believe Jason Briggs because I believe in the truth of the revelation he received in November, 1851, from which came the Reorganization. As this group separated from all the factions, waited for young Joseph, and stood against polygamy, the gifts of the Spirit were given to them abundantly. And the Spirit always honors those who do the will of the Father. Because the Spirit was taken from William’s group (as indicated in the revelation and some historical accounts) he was probably involved in things not pleasing to the Lord, as indicated in the revelation. Whether William actually practiced polygamy, I do not know. To me, the sources supporting that claim do not provide evidence enough to prove he did. I firmly believe according to Briggs’ revelation that had William continued to represent young Joseph as the rightful heir to the Presidency of the High Priesthood and to stand against polygamy, the gifts of the Spirit would have remained with his group and it would have become the Reorganization. It’s important to note that regardless of whether William taught or practiced polygamy, to my knowledge he always testified that Joseph and Hyrum did not teach or practice polygamy. Makes me wonder why William would engage or teach the practice knowing his brothers never did? If he was against BY why on earth would he have given way to this? Is it possible that he just had an affair and repented? I'm not sure it has ever been proved he practice polygamy. However, he did teach it, at least in 1851. Why, I'm not sure. I've just posted a follow-up piece to my review of Joseph Smith Fought Polygamy over at the Pure Mormonism blog. Also I've linked to you here. Let's hope more people will find the topic worth further looking into. Thanks for letting me know about your recent post. I'm looking forward to reading it.